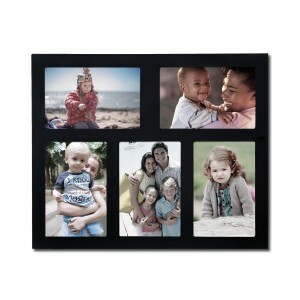 This simple multi photo frame is a great addition to your living room or kitchen decor. The matte finish subtly encloses a black and white collage of family photos or provides bold contrast to a collection of full color images. Space for five photos and the option to hang horizontally or vertically gives you freedom to display a series of child birthdays a collection of wildflowers or a combination of your favorite shots. Order a few for gifts or create an eye catching collage for every room of the house. This frame is a wonderful choice for a birthday, wedding or anniversary gift.